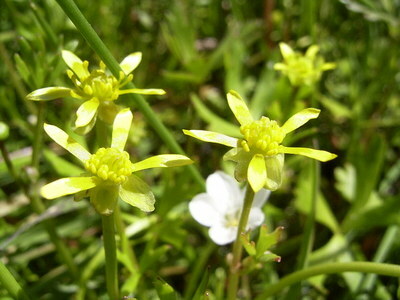 Flowering stems are slender and erect, and bear 1-3 pale golden yellow flowers with 5-7 petals. Perennial herb growing in shallow water, with floating or submerged round and deeply divided leaves, and stoloniferous stems. Still to slow-flowing, shallow fresh water throughout the State. Grown by seed, by division or by cuttings. Suitable below powerlines.